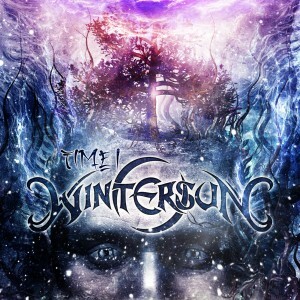 It's been a long time since Wintersun released their debut album - eight years in fact. Jari Mäenpää appears to subscribe to the Axl Rose school of album making to take that long over an eagerly awaited album. So after eight years it would be reasonable to expect a superb album, but what Wintersun have delivered is somewhat surprising. You get a whole five tracks - yes you read that right, just five tracks. It gets worse - two of those are basically intros (one four minutes long, and the other just over two minutes), so it's down to just three proper songs. In Wintersun's favour, the shortest of these three is over eight minutes long and the longest is over thirteen minutes long, but still - 3 proper songs on an album that's taken eight years to produce ? Surprising to say the least. It gets slightly more understandable when you find that there is a second album due out in 2013 - "Time II", but it also makes it more appalling. Rather than release one double album of Time, they've chosen to split it into two separate albums (can anyone think of a reason for this other than to make more money? No nor can I). OK so it's a long overdue release and is really only half the Time album, even if it does have a 40 minute running time, but looking past those criticisms, is it any good? The short answer is - Yes it's extremely good in fact. It's hard to describe a song without using thousands of words when a song is over ten minutes long and changes significantly several times thoughout the song. "Sons of winter and stars" contains some fantastic orchestration and epic sounding parts, but towards the end sounds more like Ensiferum (Jari's previous band). That pretty much sums the album up - imagine Ensiferum with some truly impressive orchestral sections and you've got an idea what to expect from the album. One concern is how key the orchestrations are to the album - it's going to make these songs unplayable live in their current form so are likely to sound very different played live. Yes it's a great album, but I think releasing Time as one double album rather than splitting it into two separate albums would have been far better and kept fans a lot happier.